Come learn How To Make Deviled Eggs with a classic, easy recipe! 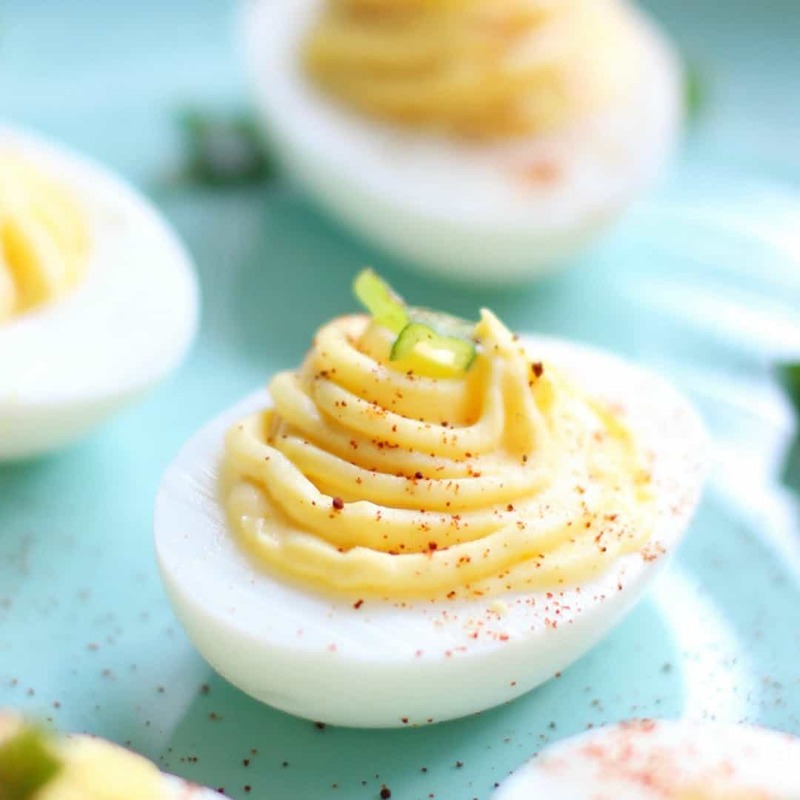 This creamy, no-fuss deviled egg recipe is a picnic and potluck favorite! Oh, how I love a classic recipe! There’s something about a simple recipe, like Strawberry Shortcake or this recipe for How To Make Deviled Eggs, that’s always a crowd pleaser. These deviled eggs are a classic formulation, nothing fancy, just a nice quick recipe that’s easy to make. 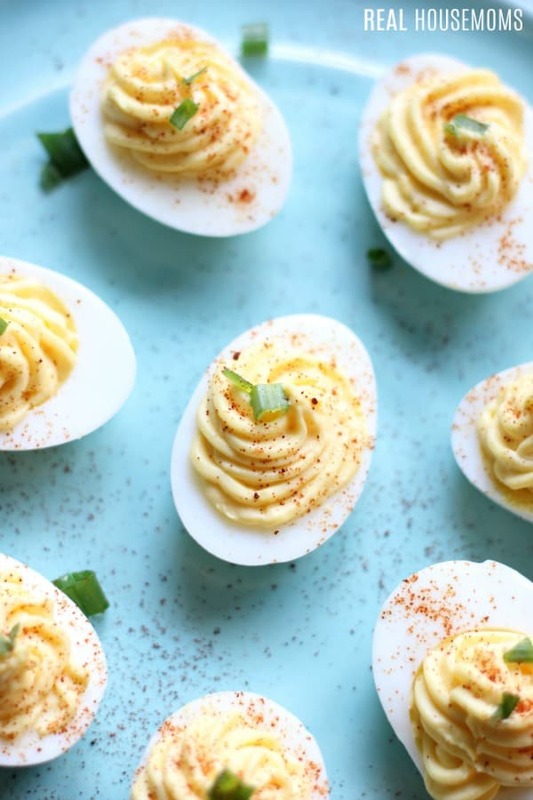 Deviled Eggs are the perfect bite-sized snack, and that’s why they’re my must-make recipe for all our family get togethers! Of course, you can always switch up this classic potluck favorite by adding different garnishes like bacon, tomatoes, roasted red peppers, jalapeños and more! No harm in giving your eggs a little personality, but this basic recipe will give you the perfect base to build on. This Deviled Eggs recipe isn’t spicy, so great for family get-togethers, potlucks and picnics. I remember having contests with my brothers at grandma’s Easter brunch to see who could eat more! Sooo, good, and well worth the scolding for eating more than our share! Deviled eggs and these wholesome Oatmeal Bars fondly remind me of time spent at grandma’s house. First, you need to hard boil your eggs. I use the following method and have perfect eggs every time. Fill a pot with water and bring it to a boil. Insert eggs and boil for 12 minutes. No more. No less. Take off heat and run cold water over eggs to stop the cooking process and let cool. The other common method is to cover the eggs with water, bring the water to a boil, and then let the eggs sit off the heat for about 10 minutes. Either way, you’ll have firm whites and perfectly set yolks. 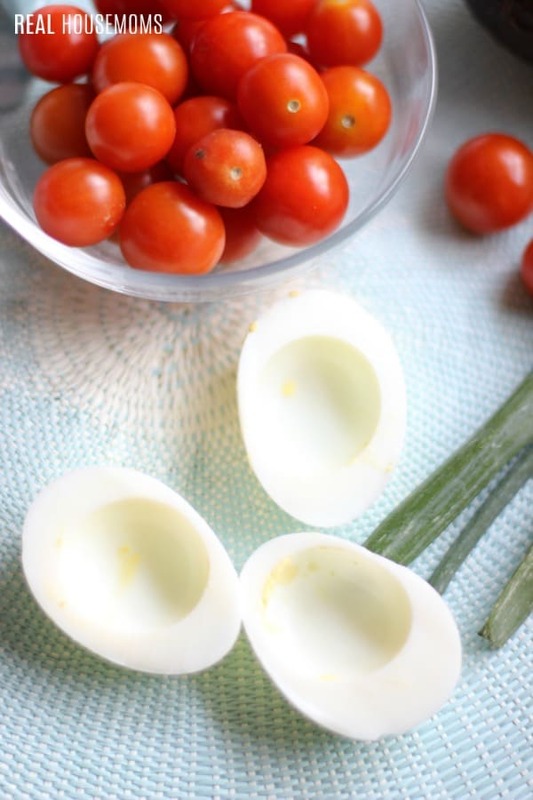 Next, you need to peel your hard-boiled eggs. After all the yolks are in the bowl mash with a fork, and then add mayonnaise, mustard, vinegar, and salt, and mix with a whisk. The tricky part is getting the lumps out, but keep mixing and it will happen because no one likes lumps! Now, pipe or spoon egg yolk mixture into the egg cups. Piping is a lot easier in my opinion than fiddling with the spoon and you don’t even need an expensive piping bag – just place mixture a plastic bag and snip the corner. Fill each egg white with enough egg yolk filling to mound over the top a bit. Finally, sprinkle with paprika and top with chives (optional) and your delicious, no-fuss eggs are done! I like to make my hard boiled eggs the day before so they have plenty of time to cool down and the way. It also cuts down on prep the day of our cookout or potluck. 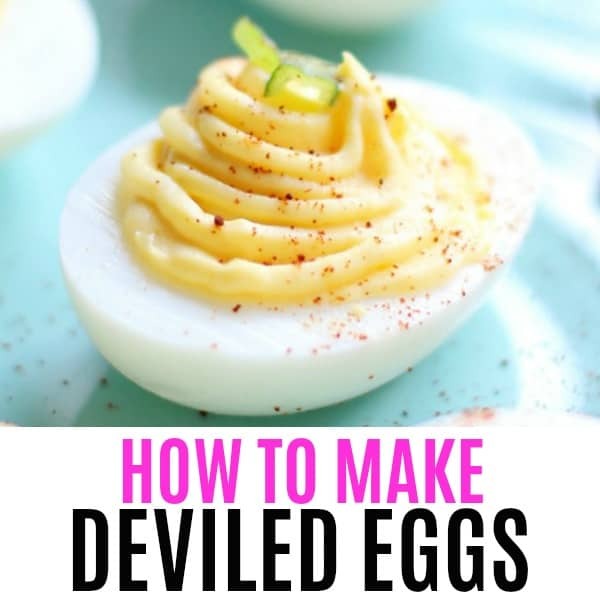 Now you know How to make Deviled Eggs and can experiment with toppings and add-ins if you like! They’re kinda like a mini egg salad sandwich, don’t ya think? Just less messy! There are so many occasions where classic deviled eggs are the perfect fit, so enjoy! 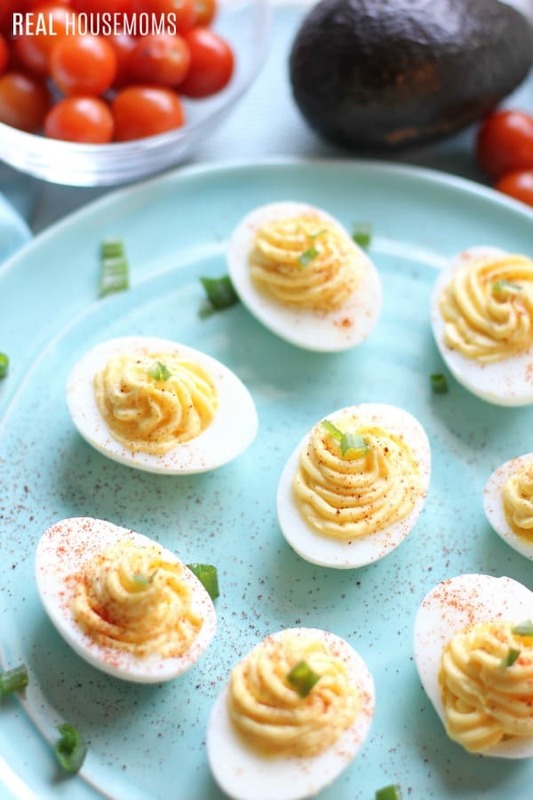 Ready to try some flavored deviled egg recipes? Piping Bags: Disposable pipings bags handy to have on hand for filling desserts & donuts and food decorating! Deviled Egg Tray: Perfect for making sure none of your precious eggs slide around and sure to win you presentation points!